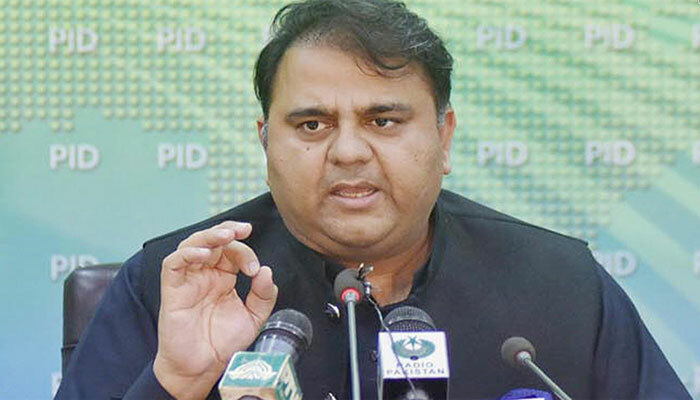 Pind Daden Khan: Minister for Information Chaudhry Fawad Hussain on Saturday said the government was fully resolved to recover the national wealth looted by former rulers. Addressing a public gathering after inaugurating electricity supply to Union Council Golpur, Choran in Pind Dadan Khan tehsil of Jhelum district, he said former prime minister Muhammad Nawaz Sharif and former president Asif Ali Zardari looted the national exchequer which would be recovered at all costs as it was owned by the nation. The project to supply electricity to Union Council Golpur has been competed at the the cost of Rs 9 million. The minister said the loot and plunder by the two former regimes was behind the country’s worst economic condition. However, nobody had dared to plunder the national exchequer since the incumbent government came to power, he added. He said Nawaz Sharif remained ill during his stay in jail, but he became healthy soon after his release on six-week bail. The minister said work on the canal project from Head Rasool to Pind Daden Khan would be initiated at a cost of Rs 37 billion soon. Similarly, he said, the road linking Lilliah Interchange with G T Road would be completed costing Rs 9 billion. It would reduce travelling time between Pind Daden Khan to Jhelum by around two and a half hours. Chohran Link Road would also be expanded, he added. He said work on water supply schemes for Golpur and adjacent areas of Chohan and Keycha Khoh costing Rs 20.5 million would be underway soon, while several link roads, which were in dilapidated conditions, would be repaired. Golpur UC office would also be constructed, he added. Addressing another public meeting at Kot Katcha, the minister said all the localities in the area, which had no power connection, would be electrified before the holy month of Ramzan. A girls college would be constructed in the area as the Pakistan Tehreek-e-Insaf government was committed to bring it at par with the developed areas, he added. He said development projects underway from Pathet Nadi area to Pind Daden Khan would be completed at the earliest. Fawad said there was no shortage of doctors in Jehulm hospitals. About 100 doctors were performing duties in the hospitals here, 78 of them transferred from other cities. He said work had already been initiated to upgrade schools in the area. The minister he listened to the public complaints at his office in Islamabad on every Thursday while he visited his constituency every Saturday or Sunday for the purpose. Local leaders Raja Shahnawaz and UC Chairman Dr Naseer Ahmed Khandoa were also present.